Sorry for the pun, but after all the overreaction I have witnessed these past 24 hours, it feels good to smile and even be a little corny. The Pelicans looked focused from the start, jumping out to a 15-4 lead on the way to a 33-15 first quarter. And unlike what we saw in the Pacers game, Charlotte never got back into this one. Anthony Davis was beyond remarkable, going for 25 points, 8 rebounds, 6 blocks, 6 steals, and 4 assists in 37 minutes in the Pelicans 105-84 win on Saturday night. Going into the game, I had a couple of keys to a Pelicans victory and they excelled in all three areas. Kemba Walker is averaging 3.5 steals per game on the young season, and Michael Kidd-Gilchrist is lightning quick when he jumps passing lanes. And surprisingly, Josh McRoberts has been very active as well, deflecting numerous passes to the interior. The Bobcats have been competitive this season because they keep their mistakes to a minimum while they simultaneously cause the opponent to take chances. The Pelicans need to avoid falling into the Bobcats trap to get this win tonight. The Pelicans turned the ball over late a handful of times when the game was already decided, but for the most part they were very careful with the ball. Walker didn’t have a single steal and very few of the Pelicans turnovers led to easy opportunities for the Bobcats, as they only had five fast break points. The Bobcats are -11 per game on the glass. They rank 26th in defensive rebound percentage and 27th in offensive rebound percentage. Bismack Biyombo and Michael Kidd- Gilchrist are far and away their best rebounders, but it is tough to keep them both on the court together because of how big of liabilities they are offensively. Instead, Cody Zeller, Al Jefferson, and Josh McRoberts are often down low for Charlotte and they have combined for a defensive rebound rate of right around 15% this season (that is Lopez-ish). The Pelicans bigs have to control the glass on both ends to ensure that they end this game with more possessions than Charlotte. Again, some bench players grabbed rebounds when this game was already decided, but the Pelicans still won the battle 43-41. The Bobcats starting front court pulled down just two offensive rebounds, so Charlotte was one and done for the most part for the first three quarters of the game. Al Jefferson not playing allowed the Pelicans to go smaller than they might have otherwise, as Thomas got the minutes we saw Onuaku get in the past. The Bobcats want to play at a slow pace, limiting possessions so that you can’t expose their lack of talent offensively, as they rank 30th in offensive rating currently. Despite playing one of their two games with the uptempo Rockets, the Bobcats are 23rd in pace. In two games this year, the Bobcats have shot just 40.5% from the field, and when you combine that with the fact that they get so few offensive rebounds, they should be plenty of opportunities for the Pelicans to fly in this game. The Pelicans got into their offense early and the end result was 30 assists on 37 field goals. People often think pace is all about fast break points, but it really is about getting into sets early and the Pelicans did that tonight. In addition, we saw some highlights from Evans, Gordon, and Davis on the break. – I know there are a lot of good big men in the Western Conference but it is getting harder and harder for me to imagine Anthony Davis getting snubbed this year. Kevin Durant and Dwight Howard are locks for a frontcourt position. Blake Griffin is extremely likely to get in, as is Kevin Love, but Anthony Davis is right there with both of those guys. His stat line was amazing tonight and could have been even better if the Bobcats didn’t go small. Playing 4 out, 1 in forced Davis to play on the perimeter defensively for most of the second half. Still, as gaudy as his stats were, I feel like he effected the game even more than the stat line shows. The Bobcats simply ran away from whichever side of the court he was on, and when he runs straight down the middle on the fast break, it opens up so much space for everyone else. I can go on and on, but I will simply say this: He is one of the top 10 players in the NBA. Already. – Greg Stiemsma’s stat line is exactly what I would have wished for going into the season: 2-2 from the field, 6 rebounds, and 5 blocks. Heck, he even had two assists! But for some reason, he just always fails the eye test and I don’t know why. You are terrified whenever he touches the ball, and every time he grabs a rebound he looks like he is about to lose it or tip it into the opposing teams’ basket. But he had by far his best game as a Pelican so far. At least, that’s what the stats say. 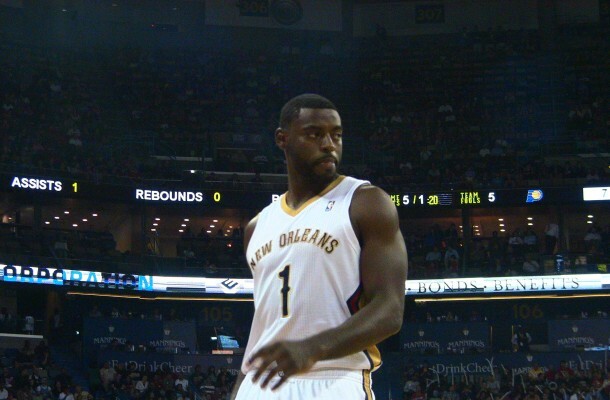 – Tyreke Evans is the point guard on the second unit. I don’t care what his player card says, and I don’t care that a six-footer is also on the court. Evans runs the offense, and that is the way it should be. Roberts is terrific weapon spotting up, and Evans seems to be able to drive and kick to either him or Morrow whenever defenders collapse. Tonight was Evans best game as a Pelican, scoring 15 points while also dishing out 7 assists and grabbing 6 rebounds in 31 minutes. When Dell signed him and Monty spoke of him being a Swiss Army knife, I think this is exactly what they imagined. – I am happy every time Anthony Morrow shoots a spot up jumper, but man, he is terrible defensively. – The Pelicans ran the Horns set several times with Tyreke Evans and Anthony Davis at the free throw line. Can you imagine how unstoppable that will be with Anderson, Jrue, and Morrow spotting up?!? – Jeff Withey and Lance Thomas played, but Austin Rivers didn’t – even in a blowout. People ask me if he is in Monty’s “doghouse.” No, he’s not. He is just a 5th guard and the four guards ahead of him are healthy, so like 5th guards on other teams, he is not playing. – The final score says the Pelicans only gave up 84 points, but honestly, their defense wasn’t that much better than what we saw in Orlando. Charlotte got a lot of open three-pointers and they also got to the line a ton. Fortunately for the Pelicans, they are a terrible offensive team, as they missed 15 free throws (21-36) and 18 three’s (3-21). We saw Ramon Sessions walk down the lane on one uncontested layup and the Pelicans have communication issues on several pick and rolls. Yes, the blocks (a franchise record 18) was nice, but there is still a lot to be fixed here. – Aminu played with more energy tonight and got the Pelicans off to a hot start. Still, Morrow got just as many minutes as Aminu tonight (22) because there is so much more spacing when he is on the floor. – I felt like Holiday and Jason Smith played incredible tonight while I was watching the game, so I was surprised to see rather pedestrian stats (save for Jason Smith’s 5 blocks). Perfect example of why you can’t just look at the box scores. The eye test will never die! – So, um, can Monty keep his job for another day or two? – I am in a fantasy league with some weird scoring system that I can’t understand, but all I know is Anthony Davis got me 52 points tonight. I have no idea how, but I do know that is the most anybody has got so far in this league. So, um, take that for what its worth. – The Pelicans have two days to prepare for the Suns. I watched them play the other night and they are fun to watch, as they love to get up and down. Not a ton of talent, but Bledsoe could be a handful for Jrue Holiday. Will be a good test for him, especially offensively where he is trying to keep the turnovers down. I think that having a player like Davis means you have to be even more careful than usual. What is the difference between D.Wade, Kobe, and Tim Duncan that made them stay when Carmelo, Lebron, D.Howard, CP3 and others left? That first group won a championship early with their franchise. With the CBA we have now, the first extension is basically a given, the young players want to buy houses and cars. But I think you need serious success by year 2 of that second extension. Sometimes Finals appearances just don’t cut it…it didn’t for Lebron or Shaq. I think Mike is right…Anthony Davis may just be a top ten player this year. There is room at top, several top stars are aging or hurt. But the Hornets have to hope that the very large list of risks they took all pan out. I think that four of their recent decisions could all be termed questionable to highly questionable, with perhaps a simply ‘non conventional’ thrown in for spice. 1) Eric Gordon max contract 2) Austin Rivers 3) large price tag for Tyreke 4) HUGE opportunity cost for Jrue. Those may all pan out perfectly. I hope they do, this team is going to be amazing fun to root for and watch. I like the above decisions in the following order 3, 2, 1, 4. But that is because I consider Tyreke to be just marginally overpaid, and I have seen 10th picks with zero upside in my time. We will have to cheer and see how things go in the future. Not gonna lie I thought Schwan was writing this one by that title. You seem to want a completely different team. Unfortunately the life of a GM isn’t so easy. thisisnola I’m not sure how to take that. Totally in a good way no offense meant. AngryCookies And you post this after a big win? What part of Evans doing nothing did I miss tonight? His stat line is 15 points, 6 rebounds, and 7 assists (versus 2 TOs) in 31 minutes tonight! That looks like starters minutes and performance to me. Are you complaining about his first pre-season game injury, blaming management for it, and not giving him any chance to get acclimated to the team in his first few regular season games? Stay off the sauce, man. We had 8 players scoring 7 points or more; all scored at a per 36 minutes double digit pace. Everyone was efficient on offense tonight, and scored around 1+point/shot. Davis doubled that and Roberts TRIPLED that, and both stuffed the stat sheet in other areas (and they combined for the best assist of the night). Everyone’s minutes were kept low except Davis’s because he was amazing tonight, Smith had foul trouble, and Anderson was out. Tonight we saw the deeper, more balanced team, we had hoped was being constructed. Let’s hope for more of that this first road trip, maybe with a little help from Anderson, too. Your photo atop this story helps illustrate something I didn’t appreciate until I saw Tyreke Evans playing in person last night: That 24 year old is ripped! Now that he’s finally getting healthy, I think we’re starting to see what a great addition he’s going to be to the team. I love the way Monty is playing him. When Evans gets out there leading the second team at the start of the 2nd and 4th quarters against the opponent’s second team, there’s very little chance of a significant change in the score. And I was very impressed with something that doesn’t show up in last night’s box score: Eric Gordon’s defense. I think we didnt see Evans playing much point in the first few games because of the ankle. Should be fun to watch going forward. It was nice to see such a strong victory against Charlotte. Say what you will about fan overreaction, but for the first game to end how many did last year, with the team coming out flat after halftime and blowing the lead, paired with a blase effort against the supposedly inferior Magic, the beginning to the much awaited season was a big downer. Regardless of wins or losses, I hope that the effort shown against the Bobcats will be what we get the majority of the season. And I would really like to see as much enthusiasm for the product on the floor as I saw for free fries last night. I’d love to run into the room screaming that there won’t be any problems. After the Orlando game I was in a very bad mood. This game gives me more hope that the chemistry is indeed improving, but I will point at the giant elephant in the room. It was the BOBCATS. I expected a blowout, and loved it. It was sorely needed after Orlando.